As you may or may not know, the St. John's campus of Memorial University of Newfoundland issued a lockdown at 8am this morning after reported suspicious activity of a person on campus who was potentially armed. The lockdown lasted roughly forty minutes, and then classes went back to normal. The suspect was detained by the RNC, and thankfully nobody was hurt or killed. I'm not usually one to blog about these kinds of things, but this case is different. Let's go back to the start of the situation, you know to fill in some background information before my opinion and the evidence I have to support it. I live in residence. When the alarm came over the speakers in Cluett, I slept through them. Yep, you heard me I slept through a lockdown announcement. I'm not the only one who did either, as some students in my building said that they slept through it or thought it was just people talking down the hallway. It was my normal, everyday phone alarm that woke me up. I answered the texts I got, letting people know I was okay; and then I did what you'd do when you're confused about what the hell is going on, check social media. I then got information from my house group, and news articles. MUN was sending out updates through Twitter. Yes Twitter, the social media platform where you can post a 'tweet' in 140 characters or less. The Tweets of MUN's account. After that, I called Mel (aka my best friend). Mainly to let her know what happened before she saw it all over social media. As we chatted, we both agreed on the same thing. That the university should have had a faster and more reliable way of getting the notice out to student and staff first, as "not everyone has Twitter." I was also talking to a friend of mine who happened to be at the University Centre (UC) at the time. She said, and I quote "We had no guidance, it was just fend for yourself." Another one of my friends were in a class in the education building when the lockdown was announced. She told me that the professor or class didn't even know until one of the students checked Twitter. So the professor closed the doors and turned off the lights (she couldn't lock them because only Campus Enforcement and Patrol ie; CEP are allowed to lock the doors.) and then they waited for the all clear. CBC has posted an article about what happened this morning, and the people that were interviewed all seem to agree that MUN should have a better way of communicating emergencies. The university's manager of communications started that MUN's students and staff are expected to check social media regularly and that an email was supposed to go out to staff but the system was down. He also started that the reasoning for using social media is because there's too many buildings for a PA announcement to be effective. An email was later sent informing everyone on campus what happened, and that support and counselling was available to anyone who feels like they need it. All that being said, the manager of communications admitted that it's clear MUN needs to change and improve the way that information about such situations are communicated to students and staff. As they say, things don't get changed until something happens. 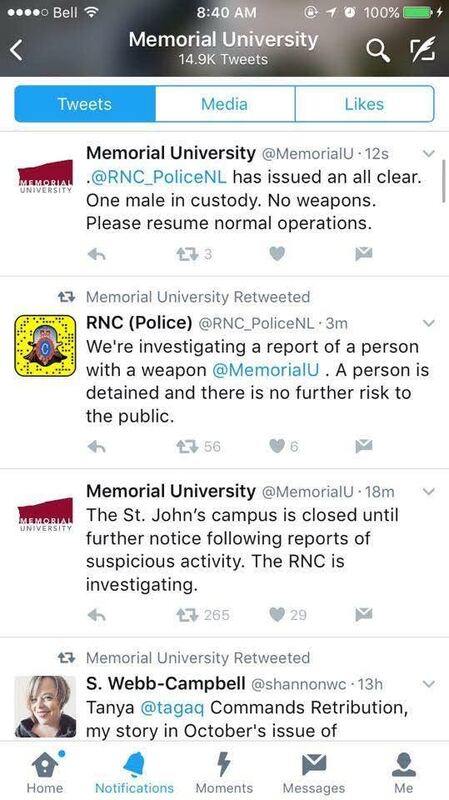 It's 2016, communicating emergencies to students and staff should be very fast and effective, Maybe MUN could text everyone the information, or even use mun.ca emails, I mean that's what those emails are for rught? contacting the people who attend and work at the university. Thankfully the situation was handled quickly and nobody was injured or killed. A lot can happen in forty minutes, and it's very very very fortunate that this scenario didn't end as bad as it could have. MUN is generally a safe campus, I'll be honest and say that I feel safe around school and in res. This event 'opened up MUN's eyes' regarding the flaws in the system, and I hope that they follow through on their word to improve communications, and that information will be communicated more efficiently if a situation like this is to happen again.